GATE(Graduate Aptitude Test in Engineering) is one the most important and in-demand entrance exam for engineering graduates in our country. M.Tech. in Computer Science is one of the most demanding courses at prestigious institutes like IISCs and IITs. GATE(Graduate Aptitude Test in Engineering) is one of the ways to get into these top institutes. Every year around 10 Lakh candidates apply for GATE exam and very few of them manage to ace the exam with good score. So the competition is clearly very tough and simply preparing without any strategy will make it difficult to land you into IISCs and IITs. GeeksforGeeks brings you a complete guide and preparation strategy to crack the GATE CSE 2019 with flying rank. We’ll guide you through out the whole course, from starting your GATE preparation to how to answer GATE questions. 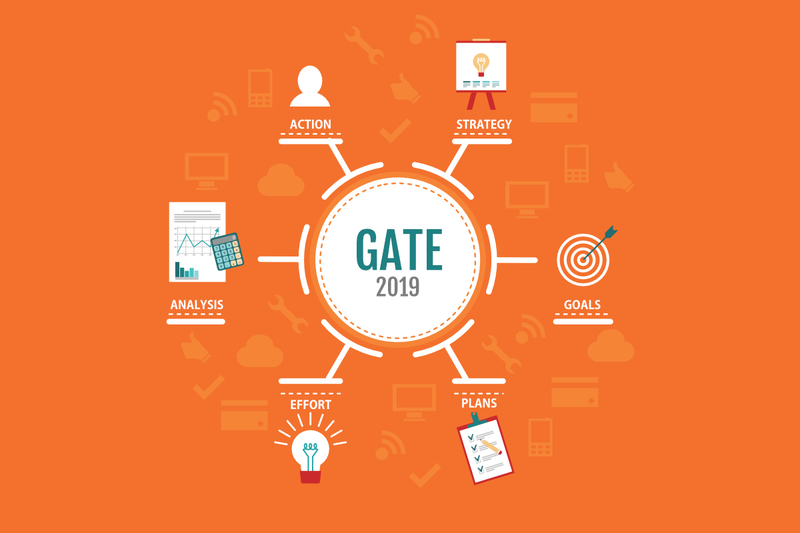 Analyze GATE syllabus: Start with analyzing the GATE syllabus. Start divide and Conquer, try to break the syllabus into sub-categories and do the same with each subject further. It will help you to prioritize subjects and important topics in each subject. After doing this, you will get a clear insight into where you stand and how far is left to cover. Analyzing syllabus will also help you to understand about the important subjects and pattern of GATE exam. Start preparing today : Time is like money, so spend it wisely. The best time to start your GATE preparation is today, just after completing this read. Just pick one of the subjects you feel good and start the preparation. You may start with some easy and scoring subjects like DBMS, Operating Systems or Computer Networks(totally depends on individual). After completing first subject and its GATE questions, you can immediately pick the second subject. As soon as two subjects are completely covered, you will start feeling more confident. After completing one subject, the immediately next task should be solving previously asked GATE questions of that subject. It will help you to uncover weak topics; try to recover those weak topics and resolve those questions. Follow a disciplined schedule : Make a schedule and follow it at any cost, literally. Decide a fixed number of hours for your GATE preparation and complete it daily; remember, consistency is a compulsion here. Maybe print a calendar from starting day to intended course completion day and stick it front of your study table. Every day you completed those hours, mark the date with green pen and do the same with red pen if you missed. Take running notes while studying: Note down the important points in notebook while covering the topics. It will definitely help you in revisions. Decide one day in a week to revise one of your previously completed subjects and use your GATE notes here. Subjects easy to score: There are few subjects which are easier to score, like Digital Logic, Mathematics and Aptitude. These three subjects cover 25-28% of complete GATE paper. Try not to leave these subjects uncovered as they are high scoring and will help to boost your GATE AIR. Track your preparation periodically: Solve previous GATE question for each subject. It will help you to recall and revise the subjects. We highly recommend giving Sudo GATE subject-wise Test series since these tests are build on learning while solving approach. Revise and practice are keys to GATE: After completing each subject, start revising each subject thoroughly. Revise the subject then solve previous year GATE questions and take subject-wise tests. Remember, the only keys to score good AIR is revise and practice more. Take Mock Tests: At this final stage of preparation, practicing quality questions before attempting actual GATE will boost your confidence and improve your problem-solving speed. GeeksforGeeks has specially designed Sudo GATE Mock tests, which will help in boosting your GATE score. Questions in these Mock Test resembles with GATE actual questions and will give the GATE aspirants trailer before the Film. Use short notes : At this crucial stage, don’t try to read any new topic. Just use your Last Minutes Notes to recall only key points in each subject. We highly recommend using these LMNs, specially designed for last minutes preparation. Schedule for Sudo GATE Course. Time management is important: Keep following the schedule for this long time won’t be an easy task. Though, you can achieve it with time management. Dividing time for each subject and topics will be very helpful. Wasting time is the worst thing any GATE aspirant can do while preparation. Also, stay away from time killing machines like social media and random youtube surfing etc. Anyway, no one can study the whole day; nor it is efficient. You can make a healthy hobby like reading Novels, watching comedy or animation movies or anything you truly like. Use this as a reward each time you finish the target. Stay motivated, but more inspired: Being motivated gives you energy to study and help you stay focused, so be motivated. But with passing one/ two-month motivation might decrease because of the efforts you are putting. Here, the inspiration comes into picture. Remember, motivation is an external force to keep you moving but Inspiration is something which comes from inside.